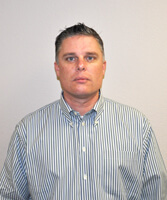 Rogers, AR – February 28, 2014 - Jotto Desk is pleased to announce that Trevor Smith has accepted the position of Canadian Sales Manager. In this role, Trevor will be responsible for increasing market share and penetration into strategic areas of Canada (OEM's, Dealers, Distributors and even more so at the Agency level). This will include working closely with the current Jotto Desk distribution network to evaluate the opportunities to grow and expand each province individually. Jotto Desk is continuing to invest in quality individuals to better serve this vital market today and in the future. Trevor officially joins the Jotto Desk Team on March 3, but he definitely is not a stranger to Jotto Desk or the Canadian Public Safety Market. Trevor initially began interacting with Jotto Desk prior to 2000 - helping to sell the first laptop mounts in Canada. The company he formed, Integra Marketing, was a Strategic Partner and grew alongside Jotto Desk. As Jotto Desk added first consoles, then docking stations and finally the back half of the vehicle to become the only Total Solutions Provider in this industry - Trevor was there to see, learn, experience and sell all of these products. His knowledge of the market, vast experience with the product line and commitment to excellence will greatly benefit both Jotto Desk, our Distribution Network and the Agencies that we all serve. Trevor will be working from his home office in Halifax, Nova Scotia and can be reached at tsmith@jottodesk.com or 902-489-1555. Trevor has been married to his lovely bride Debbie for 15 years and they have a charming 11 year old daughter (Abigail) and a spitfire 6 year old son (Avery). Our experienced Customer Service Department is also available to help as needed. Feel free to contact them for requests for information, part numbers, shipping/tracking information and other needs. Crystal Sandford (ext. 6401) or Debbie Rice (ext. 1975) - they will be happy to assist you. 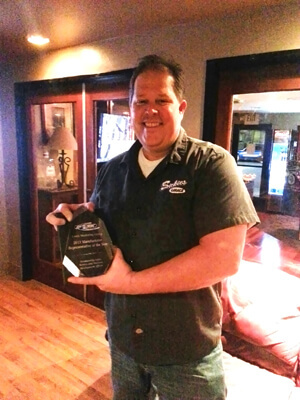 Jotto Desk congratulates 144th Marketing Group as our 2013 Manufacturer Representative of the Year. 144th Marketing Group's excellence in service, outstanding sales and business development efforts are genuinely appreciated. As the market's "Total Solutions Provider" (TSP), Jotto Desk works to redefine the mobile workspace and expand its' portfolio of high quality products and ability to deliver maximum value to customers and with our "Strategic Partners in Excellence" we can achieve these goals. Assembled Products™ Corporation, a Rogers, Arkansas company, is celebrating 30 years of manufacturing Products that Make Life Better. Assembled Products™ Corporation has grown from selling a single product in 1983 to operating several divisions and manufacturing several products in 2013, including Mart Cart®, Jotto Desk®, NRA® Jotto Gear, Spray Master Technologies®, and Hub Motors. In 1983, entrepreneur William Sage built the first prototype for the Mart Cart®, an electronic shopping cart for the mobility impaired. Working from his Rogers garage, Mr. Sage hoped to provide a solution for shoppers like his elderly grandmother, who could not accompany the family on shopping trips. Today, the Mart Cart is the premier mobility aid for shoppers in many Fortune 500 grocery, drug, and warehouse format retail stores. In addition to the Mart Cart, Assembled Products’ portfolio includes other Mart Cart® brand mobility products; Spray Master Technologies® high pressure cleaning equipment; Jotto Desk®, the Total Solutions Provider for public safety and fleet vehicles; NRA® Jotto Gear, advanced technology in personal security solutions; and Hub Motors OEM equipment. The company employs 139 people and has also experienced success in contract manufacturing for synergistic products. The company will hold a 30th Anniversary celebration December 20th from 11:30 a.m. to 1:00 p.m. at the Assembled Products™ Corporate headquarters located at 112 E. Linden Street in Rogers, where Mr. Sage will be the featured speaker. Employees and Invited Guests are welcome to attend. For additional information about Assembled Products™ or their 30 year milestone, please contact Erin Kiefer at erin@assembledproducts.com or visit www.assembledproducts.com. Media attendees should RSVP by December 18th to Anita Warren, at (479) 246-6412 or anita@assembledproducts.com. Jotto Desk is pleased to announce a newly designed Floor Plate for the 2014+ Chevy Silverado 1500. The Jotto Desk team has worked to ensure that the products they introduce stand up to the high demand for quality, durability and functionality. UPDATE: The Floor Plate for the 2014+ Silverado works specifically for the 1/2 ton/1500 model. The 2014+ Silverado 2500+ models have not changed and the 425-6204 floor plate is the correct solution for these vehicles. The 28" Floor Plate provides an extremely stable mounting platform to secure equipment consoles and other accessories (cupholders, arm rests, printer mounts, etc). The floor plate legs are secured to the OEM structure using our No Holes Mounting System, featuring identical front/rear mounting legs and easy top-down installation. The floor plate is currently in-stock and ready for shipment. Be on the lookout for other Jotto Desk products for the 2014+ Silverado 1500. Please call your Sales Manager or Customer Service with any additional questions you may have. Jotto Desk is pleased to announce the release of the 2014+ Chevy Silverado 1500 and GMC Sierra 1500 No Holes Mount. The Jotto Desk team has worked to ensure that the products they introduce, to its' customers, stand up to the high demand for quality, durability and functionality. Jotto Desk is confident that its' Computer Mount for the 2014+ Chevy Silverado 1500 and GMC Sierra 1500 will exceed those expectations and will provide the safety and security that our customers rely on. 2014+ Silverado/Sierra 2500/3500 - ONLY the 1500. The 425-5117 is the No Holes solution for the 2500/3500. Our engineering team has designed this base with many different combinations and needs in mind. This NHM will fit every seat configuration (40/20/40 & Full OEM Console) - unlike our competition. The 14+ Silverado 1500 Floor Plate (released 9/6) and the No Holes Mount, while separate products - must work together and Jotto Desk realizes the importance of the Total Solution. Both have been designed to work together - allowing the Jotto Desk floor plate and NHM to become a complete solution for your mounting needs. Maximize your workspace and optimize your time and efficiency with a Jotto Desk laptop mount for your 2014+ Silverado/Sierra 1500. This computer mount is a No Holes drilled, ergonomic, articulating arm desk used as a platform for mobile professionals to secure and comfortably use a laptop computer in a vehicle. The patented Cable-Dock® securing system uses two thin nylon-coated steel cables that wrap up and over the keyboard section of the computer for a firm and positive grip. This securing system will give you peace of mind knowing that your laptop is secured. The overall design of the 2014+ Chevy Silverado/Sierra 1500 Computer Mount allows you to pull the desktop over for comfortable operation, reducing back strain. Stand height is adjustable and can be removed from No Holes Base in seconds when not needed. Field proven over the past 17 years the Jotto Desk offers mobile professionals the best rugged laptop mount. Made of recyclable materials, our laptop workstation creates a proven mobile office for cars, trucks, vans, SUV's and Big Rigs. Jotto Desk is easy to install, easy to set-up and easy to use. From individuals to fleets this laptop desk will place your notebook at your fingertips when parked. Leading public safety equipment manufacturer sets new standard in home defense and concealed carry firearm access. Rogers, Arkansas, May 1st, 2013 – Jotto Desk, introduces an industry first, redefining discreet access for home defense and concealed carry firearms. As the leading enterprise-class mounting solution provider in public safety, Jotto Desk is carrying its expertise to the consumer market through its “Official NRA Licensed Product” line called Jotto Gear. The Jotto Gear brand line consists of the NRA Home Defense Cabinet; the NRA Handgun Holster and the NRA Cargo Slide. This exceptional product line will be available for purchase at select resellers or online at www.nrajottogear.com . No longer hide your home defense firearm underneath the bed, behind a door or in a closet. The NRA Home Defense Cabinet by Jotto Gear is a discreet gun cabinet with sliding mirrored front which features a proprietary biometric securing system. Capable of housing either a shotgun or assault rifle this system can be used with the biometric version of the NRA Handgun Holster by Jotto Gear providing access to two firearms in one cabinet. Lock-up your concealed carry when you can’t carry. Featuring a familiar holster design, but made with steel, the NRA® Handgun Holster by Jotto Gear comes with mounting brackets to give you a choice of where you want to lock your handgun when you can’t carry. Designed to house most* semi-automatic handguns, the NRA Handgun Holster features a unique Quick Flip Locking Bale to lock the handgun in the holster. Black leather lined steel holster body keeps handgun clean and free of scratches and works with most tactical lights and laser grips. The NRA Cargo Slide by Jotto Gear provides easy access to cargo in a pickup truck or SUV at the campsite or on the job. Truck caps and tonneau covers make it hard to access your camping gear, tackle, tools and other cargo. The NRA Cargo Slide eliminates crawling into truck beds. Constructed from extruded aircraft grade aluminum, our anodized cargo slides are strong yet lightweight. Slide removes from the truck bed in under a minute if needed. Jotto Gear’s exceptional line of “Official NRA Licensed Products” will be offered through Jotto Desk’s premier partner network and online at www.nrajottogear.com. For additional information on Jotto Desk’s “Official NRA Licensed Product” line Jotto Gear, contact Stuart W. Sage at stuart@jottodesk.com or visit www.nrajottogear.com . Jotto Desk has the technical resources and intellectual property required to deliver maximum value to customers serving a wide variety of industries. ABOUT JOTTO DESK – www.gojotto.com Since 1994 Jotto Desk, a business unit of Assembled Products™ Corporation of Rogers, Arkansas, has been innovating and manufacturing laptop computer mounts and equipment consoles for mobile professionals. First to the market with The Mobile Office Desk®, Jotto Desk has grown its product lines offering individuals, fleet managers and IT professionals solid, best in class solutions for mounting and docking laptop computers in all types of vehicles. Jotto Desk products are used in public safety, homeland security, military, infrastructure, sales, service and transportation fleets in small to large businesses. In 2006, Jotto Desk re-defined cargo management with the Jotto-Cargo Slide, a line of truck and SUV cargo slides that provide easy access to cargo in the bed of the vehicle. In early 2009 Kodiak Mobile, a 16 year veteran manufacturer of mobile docking stations was added providing entry into mobile electronics. Kodiak Docking stations are turn-key solutions totally automated with “intelligent power management systems, charging and many laptop protections. December of 2009 Jotto Desk acquired Patriot Products completing it public safety product offering making it the leading public safety equipment manufacture. Rogers, Arkansas, May 1st, 2013 – Jotto Desk, introduces an industry first, redefining discreet access for home defense and concealed carry firearms. As the leading enterprise-class mounting solution provider in public safety, Jotto Desk is carrying its expertise to the consumer market through its “Official NRA Licensed Product” line called Jotto Gear. The Jotto Gear brand line consists of the NRA Home Defense Cabinet; the NRA Handgun Holster and the NRA Cargo Slide. This exceptional product line will be available for purchase at select resellers or online at www.nrajottogear.com. Jotto Gear’s exceptional line of “Official NRA Licensed Products” will be offered through Jotto Desk’s premier partner network and online at www.nrajottogear.com. For additional information on Jotto Desk’s “Official NRA Licensed Product” line Jotto Gear, contact Stuart W. Sage at stuart@jottodesk.com or visit www.nrajottogear.com. Jotto Desk has the technical resources and intellectual property required to deliver maximum value to customers serving a wide variety of industries. 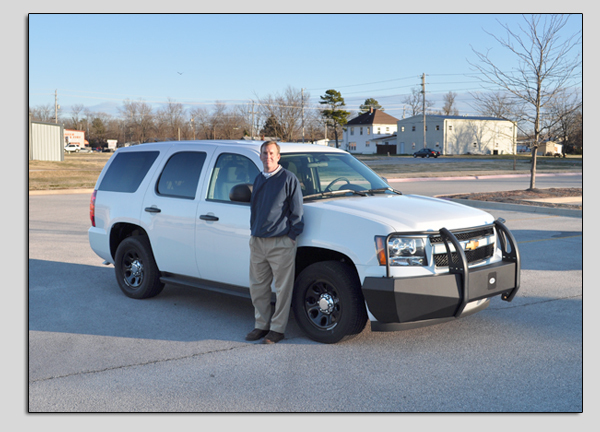 Rogers, AR – January 10, 2013 - In our ongoing quest to provide better service and reach more and more customers face-to-face, Jotto Desk is extremely excited to introduce Danan Kennedy and Four Winds Technology Inc. Danan comes to Jotto Desk with a long and successful past in law enforcement sales…having worked for Motorola, L-3 and others in this region. His extensive knowledge of the Public Safety market and work ethic bode well for the expansion of the Jotto Desk product line in his new territory (Missouri, Arkansas, Louisiana and Mississippi). Danan will be working out of Conway, AR and traveling into his territory on a weekly basis. He currently has a brand new Tahoe – outfittted with the latest and greatest from Jotto Desk and has access to the Jotto Desk fleet of demo vehicles (Charger, PI Sedan, Impala). The addition of Danan to the Jotto Desk Team provides agencies and our Dealers/Distributors a consistent name/face to help grow the territory. Rodney Weyer (AR,LA,MS) and Kym Burt (MO) are still the Jotto Desk Sales Managers covering these states – but with Danan’s addition – they will be focusing more of their efforts in other states. Jotto Desk is committed to helping make your jobs easier and assisting you with your every need. Danan is a tireless worker that will keep you on your toes and keep you smiling. His personality and commitment fall right into the Jotto Desk way of thinking. 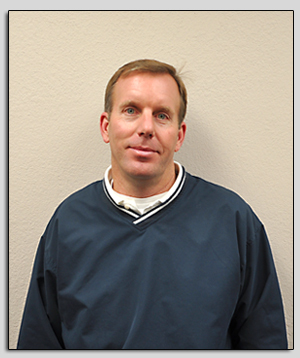 Danan will be assisted in the office by our experienced Customer Service Department. Feel free to contact them for requests for information, part numbers, shipping/tracking information and other needs. Crystal Sandford (ext. 6401) or Debbie Rice (ext. 1975) - they will be happy to assist you. If you have any additional questions, here is a list of important contact information. As the market’s “Total Solutions Provider” (TSP), Jotto Desk continues to advance its’ product line and reputation as the industry leader in public safety equipment. Jotto Desk works to redefine the mobile workspace and expand its’ portfolio of high quality products and ability to deliver maximum value to customers. Jotto Desk is pleased to announce the release of an additional Space Creator partition - available first for the Ford PI Sedan. We are excited about these changes and the continued improvement of this design. Initially released for the 11+ Dodge Charger, the patent pending design of the Space Creator partition did what no other partition design could do. It provided the maximum room for the driver, yet created room for a prisoner due to the Bidirectional Recessed Housing (BDRH). Not satisfied with our initial success nor too proud to listen to our valued customers - Jotto Desk looked to make improvements. The Jotto Desk team has worked to ensure the products they introduce stand up to the high demand for quality, durability and functionality. Jotto Desk is confident that this NEW Space Creator partition (SC MAX) will exceed those expectations. The New Space Creator MAX Partition creates ample room for even large prisoners. One change to this New Space Creator partition - was to the Bidirectional Recessed Housing. Our engineers slightly changed the design on the recessed portion that goes into the prisoner area, eliminating the initial kickback. This change has made for a much smoother downward flow, while still providing a recessed area in the front compartment for vertical mounted gun racks/printers/etc. Close Up Of New Bidirectional Recessed Housing. The initial Jotto Desk partition design/concept for the PI Sedan was identical to what we accomplished with the Dodge Charger. Give maximum seat travel for the Drivers Seat - and allow the BDRH to provide the extra room for a prisoner. This "Heritage Design" is still available for those agencies with Large Officers needing Maximum Seat Travel. Another change to the NEW PI Sedan SC MAX partition, is the placement/location of the partition. Additional input from our agency partners - unveiled a feeling that there are a lot more large individuals arrested than there are in the drivers seat. That more room for a prisoner would be welcomed...even when that means the driver won't have full seat travel. Therefore, we designed this NEW partition location/placement to mirror the location of our competition...so we would all be equal in that regard. The benefit on the road is improved room for a prisoner and making it easier for an officer/deputy to put the prisoner into the vehicle. prisoners that are secured on the Driver Side of Vehicle. A final change, recently already implemented but not fully advertised - is the change to how we secure the partition to the b-pillar. Initially we had chosen a location, void of boron steel to drill/attach the b-pillar brackets. However, OEM changes to the b-pillar at some point made our drilling location a point of pain and frustration. Jotto Desk engineers then designed a new bracket that utilizes OEM holes/slots and can be bolted into place and requires no holes to be drilled. We feel these significant changes will benefit the officer and the installer. For more information on this and other Jotto Desk offerings, contact your Sales Manager or a Customer Service Representative at 877-455-6886. Jotto Desk is pleased to announce a new Universal Mounting Station for Tablet Computer devices. The Jotto Desk team has worked to ensure that the products they introduce, to its' customers, stand up to the high demand for quality, durability and functionality. Jotto Desk is confident that its' Universal Mounting Station for tablets will exceed those expectations and will provide the safety and security that our customers rely on. your Tablet device at your fingertips. The Kodiak Mounting Station will secure your tablet from theft using the barrel key securing system. The mounting station is adjustable, allowing for various sized tablet computers. Jotto Desk recommends the use of a rugged case to protect tablet when utilized outside mount. - Collapsed Dimension: 9.840" x 7.500"
- Expanded Dimension: 12.500" x 8.300"
design allows display to be viewed landscape or portrait. The Mounting Station interfaces with a Jotto Desk No Holes Laptop Mount, allowing the laptop to be secured and ergonomically interacted with. As well, this design will allow the Tablet Computer to be viewed in either a Landscape or Portrait setup. Field proven over the past 16 years, the Jotto Desk offers mobile professionals the best rugged laptop mount. Made of recyclable materials, our trusted laptop workstation creates a proven mobile office for cars, trucks, vans SUVs and Big Rigs. A Jotto Desk is easy to install, easy to set up and easy to use. From individuals to fleets, this laptop desk will place your notebook at your fingertips when parked. Jotto Desk is pleased to unveil a new Window Armor design for the new 2011+ Chevy Caprice. The Jotto Desk team has worked to ensure that the products we introduce to our Public Safety customers stands up to the high demand for quality, durability and functionality. Jotto Desk is confident that its' solutions for the 2011+ Chevy Caprice will exceed those expectations. Jotto Desk already offers a line of "bar style" window armor for the Caprice. As we have continued to interact and listen to a couple of our most valuable assets... those actually putting the cars together and those driving the cars...we have discovered a need that was not adequately being met. That need was for this type of Window Armor - the Secure-Grid Window Armor. You can now protect your vehicles while transporting prisoners with Jotto Desk's line of Secure-Grid Window Armor and Door Panels. The Window Armor is easy to install, prevents side windows from being kicked out and nobody can reach in or out of the prisoner compartment. Door Panels protect door mechanisms, prohibit contraband from being hidden and are very easy to clean. These items are designed for a perfect fit in the 2011+ Chevy Caprice. As the market's Total Solutions Provider (TSP) Jotto Desk continues to advance our product line and reputation as the industry leader in public safety vehicle equipment. Jotto Desk works to redefine the mobile workspace and expand its' portfolio of high quality products and ability to deliver maximum value to its' customers. As your Total Solutions Provider, Jotto Desk is able to ensure that all the products that it manufactures will work together seamlessly from installation to application. When you think Jotto Desk, think TSP.